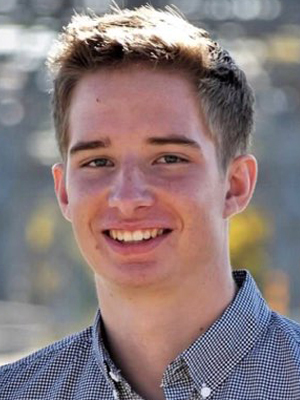 Joey Matuza, of Shakopee died unexpectedly on March 24, 2019 at the age of 19. He was a wonderful person and will be deeply missed by all who loved him. A gathering of family and friends will be held on Saturday, March 30, 2019 from 10:00 am – 12:00 noon with a Celebration of Life Service at 12:00 noon. All services will be held at Friendship Church, 12800 Marystown Rd., Shakopee. Pastor Mike Golay will preside and urn bearers will be Joey’s siblings, Jacque, Marc and Luke. On June 2, 1999, parents Joe and Emily (Swaney) Matuza celebrated the birth of their second child, Joseph Walter Matuza, Jr. Also, there to welcome him was his older sister, Jacque. Soon after Joey’s birth, their family became fulfilled with the addition of younger brothers, Marc and Luke. Family meant everything to Joey. As a family, they enjoyed hiking and traveling. They road tripped to the Grand Canyon, Yosemite, Yellowstone, The West Coast, East Coast, South and whenever they were by water, Joey would try to find a place to cliff dive. He also couldn’t resist climbing anywhere he could. Joey was tight knit with his siblings. They always discussed movies, playing video games and listening to music. He had a love for music like his dad and a love for movies like his siblings. As a young child, Joey enjoyed Legos, making movies, and running 5K races. He participated in football, baseball and wrestling. He worked very hard at all the sports and had wonderful coaches. Whatever he was participating in, Joey embraced it and enjoyed the experience. As he got older, he learned the value of hard work and saving money to go to college. Working jobs at Hy Vee, Five Guys, Valley Fair, and doing landscape for the school district allowed Joey to attend school at North Dakota State University. He always received good grades, which continued through college. Joey gravitated towards becoming an educator as he believed in giving back. Joey had a great sense of humor, and lived his life respecting others and being an honest diligent man. . He will be sorely missed by his parents, Joe and Emily Matuza; older sister, Jacque Matuza; younger brothers, Marc Matuza and Luke Matuza; grandparents, Linda Matuza, John and Jacque Swaney: many loving relatives and friends. Arrangements with Ballard-Sunder Funeral Home & Cremation, Shakopee Chapel. My deepest sympathy. No parent should ever bury their child. Your family will be kept in my thoughts and prayers. We are so sorry. Our hearts ache for you. Keeping you in our prayers. I am so sorry for your loss. I am at a loss for words. Please know that I will keep you and your family in my prayers. My thoughts and prayers are with you all during this devastating loss. So sorry for your loss! My heart goes out to you. Words fail. Love abounds. Sharing your grief. Holding you all in prayer. Every tear is wiped away forever, no more pain or suffering. Joey absolutely has found a place where he fits. It is safely within the arms of Jesus. Our hearts cry out with your family. John 11:35…Jesus wept. Even our Lord and Savior wept when He was told of his friends passing. We are without words to express our sympathy for your family and what you all must be going through. May the peace that passeth all understanding comfort your hearts now. Oh Joe and Emily, I cannot begin to comprehend the grief you must be experiencing. When I saw this announcement, I was overcome with emotion. May God be close to you and your children as you mourn the loss of Joey. I wish I could be there to give you a big hug. May you feel the arms of Jesus surround you to comfort you. Love you. Words cannot even begin to express our sympathy to you and the kids. Joey was really one of the nicest young men I had the privelaged to be around. I know everyone says that when someone passes but it’s so true in this case. I can remember coaching him in his first win he ever got in Jordan, he was so humble yet happy. Emily you were at the match and you had been talking to Heather about him really needing a win. If i remember correctly he won the next match too. He didn’t get overly excited or jump up and down, he just had his smile on his face and kinda quietly came off the mat. I remember him standing out in his hotdog costume at the food wagon with the same smirk. He had that oh shucks little grin that he kept till the last time I talked to him. He was working at HyVee and we had a nice little chat. Andy Voit and I had a conversation today about Joey and how highly we both thought of him. I think Andy nailed it when he said he was a gentleman. I don’t think alot of boys now a days fit that description but Joey definately did. It just doesn’t seem real in any way and it’s definately not fair in the least. Joey could easily be one of my boys or anyone’s son and the pain you are going through I can’t imagine. Please know that you are wonderful caring parents and you raised an incredible young man who really touched alot of people. I wish anything I could say could bring some comfort but I know in this the hardest of times their are no words. All i will say is that you have all of our love, support and prayers. I would like to express my deepest condolences to the Matuza family. I was acquaintances with Joey during our tenure at Shakopee Senior High. He was a very likable person, and we shared common interests in weightlifting. I remember running into him upon occasion at the Community Center. I will forever cherish our in class talks, and friendly interactions. I also hope that you take solace in knowing that Joey has positively impacted my life in many ways, and that I have nothing but the utmost respect for him. Again, I would like to extend my deepest sympathies towards your family in this time of grief. Joey was one of the funniest, goofiest guys I had met at Shakopee. He never failed to make me smile in the back of math way back in junior high. I never heard a single rude word towards another person from him and not a single person didn’t like him. He was quiet, but he was extremely kind and caring and really did make my time in school happier and more enjoyable. I send you all my well wishes and support during this difficult time. So very sorry, Emily and Joe, may God give you the comfort that only He can. We are all thinking of you and wishing you moments of peace and comfort as you remember your son, your brother, and a beautiful human being who brought joy, laughter, and comfort to everyone who had the priviledge of knowing him. We all loved Joey and we are sharing your sadness. Please accept my greatest condolences. I kind of knew Joey throughout middle and high school. I always thought he was one of the most chill and easy dudes to talk to. I’ll keep all of those who are impacted by his loss in my prayers. We were so sorry to hear of your loss. May God grant you peace and healing during this difficult time. We are praying for you. Oh what a hard thing the Lord has asked of you. I’m so sorry about the loss of your son and pray that the comfort of the Lord, His word and family/friends is near to you. Our comfort also is that we have the hope of Jesus for a wonderful reunion in heaven. HUGS and prayer for your hurting hearts. I am deeply sorry for your loss! Such a handsome young man taken from you too soon! I hope the years of memories you created with him will help your heart heal. May our lord bless you and wrap you in his loving arms. I might don’t have the right word to said. It’s unbelievable this happened. I was his manager for the entire time I worked with him in five guys. I meet him when he was 14 years. I saw him grew. We had a family at the store, all the kids included joey called my mom. I had an amazing time training him, working with him and became friends. During and after his time working for us. He was a nice and sweet kid. Very hard worker and nice friend. My most sincere condolences to all. We don’t have words to express our concern and sorrow for your family. We pray that you experience the love of the family of God surrounding you. Matuza family – we are so sorry to hear this sad news. May God give you strength and comfort during this very difficult time. Our thoughts and prayers are with you. My heart broke for you when I heard this news. Both Mandy and I are keeping you in our prayers as you navigate through these incredibly difficult times. Please know that we will be there to support you in whatever ways possible. Joey was one of the kindest people i came across at SHS. He ALWAYS laughed at my jokes with his little grin he made and helped me with my Biology homework even if he had no idea what he was doing. Joey was always nice to everyone and was a friendly face to see in the halls or to sit by in class. This news has deeply saddened me and I do not have the right words to say except the memories I have of his kind soul. He was humble, kind, and the memories I have of him will I will continue to cherrish. I am so sorry for your loss, I give you my deepest condolences. I’m so sorry to hear about the loss of Joey. I had Joey and Marc in my 8th grade English class. He was always a sweet kid. My thoughts and prayers are with you and your family during this difficult time. May God wrap his arms around all of you during this difficult time. Thinking and praying for you all. Joey was a great kid and wrestled hard at matches. That’s where so first met Joey and your family was in youth wrestling. Great kid called home way to early. Joe and matuza family I am so Terribly saddened by the loss of your son and loved one!!! I pray that the God of all comfort will give you comfort,peace,and his love during this very trying time!!! May the peace of God which surpasses all understanding guard your hearts and minds in Christ Jesus!!! LOVE you ALL and continually praying for you!!! I’ve been friends Joey since elementary school, he was so smart and was usually quiet, but when he did talk he would always have the funniest things to say, he could get the whole room laughing instantly. I’ll always remember and be thankful for the beef sticks with cheese he would always share with me during our bus rides to wrestling meets during junior high. I am sorry for your loss my deepest condolences. I don’t even know what to say. I am so sad to hear this news and my heart is breaking for all of you. Please know I am praying for you to find some kind of peace and comfort during this time. ” And God shall wipe away all tears from their eyes; and there shall be no more death, neither sorrow, nor crying, neither shall there be any more pain: for the former things are passed away.” Rev 21:4. Joe and family I am sorry for your loss of YOUR son and loved one!!! I pray that the God of all comfort will give you comfort ,peace and his LOVE to carry you guys through this very sad time !!! I LOVE you Joe and your family !!! Jeff Collins. I am praying that God will give you His comfort and peace as you grieve. We are so sorry to hear about the loss of your son Joey. Our hearts go out to you and your family. I am at a loss for words. It seems like yesterday that Joey and I were wrestling partners. At the news of his passing, I had talked with many of our mutual friends about the news and of all the people I talked to, every single one said two things. First off that he was one of the nicest, most caring people out there. He never had a rude comment about anyone. Second, that he was one of the most humorous people they have ever met. He had his own unique sense of humor that everyone liked. You will be missed and forever in our hearts. No words can express how sorry we are about Joey. Keeping your family in our thoughts and prayers. Prayers and sympathy to you and your family! We have never met! But my heart goes out to you! I have lost two children of my own…. The pain of losing a child is just unbearable! Lean on family and friends! God Bless …. We grieve along with you at the loss of young Joey. He was a gentle, kind young man. My heartfelt sympathy goes out to all of you and extended family and friends on the passing of Joey! Joey would pass by the greeter’s desk at the high school and ever once in a while I would reach out to talk to him and get him talking and laughing! Your oldest son was a fine young man!!! God’s blessings to all and all my love and support! While I didn’t know Joey, I just know he was a wonderful person like his mom is. She always has a smile for me when I come into Sun Path. I am so sorry for your loss. Please know many people in Shakopee are praying for your family and grieving with you. Treasure your memories and know God is with you all. My heart breaks for you all. Please know that so many people are praying for your whole family, for the comforting presence of God to be with you, and memories of Joey to hold onto. My heartfelt sympathy and love to your whole family. We are so sorry for your loss. Prayers to all of your family. There are no words to express how sorry we feel for the loss of your son Joey. Joey was a kind, quiet, and intelligent person. We enjoyed listening to your stories of your family vacations, and how much fun and love your family shared together. Those are special memories you will never lose and cherish forever. Sue, Jack, and I remember fondly the wrestling weekends we would go on together with you and Joe, especially to Lake Crystal. I loved helping coach Joey and remember those long arms of his putting his opponent in a cradle. He was so much fun to watch wrestle. You will be constantly in our thoughts and prayers for the difficult days ahead and Joey will be forever in our hearts. “What we have once enjoyed, we can never lose. All that we love deeply becomes part of us. Such heart breaking news of your loss. There are no words right now except that I am holding you in my heart and prayers. May you feel God’s strength and comfort, now and in the days ahead through God’s love and your many friends. My deepest sympathy for your family. Thinking and praying for you. We are completely at a loss of words. May God wrap His arms around you bringing comfort to all of your family. We cannot imagine the pain you are feeling. I knew Joey for quite a while. We wrestled together and I spent some of the best years of my life with him. He taught me a lot during wrestling. He taught me how to win with dignity, but more importantly, he taught me how to handle defeats which in turn helped me grow as a person. He seemed to always have a smile on his face, and although he wasn’t the most talkative person I’ve met, he certainly knew how to make his words count. He always seemed to put a smile on my face and regardless of what kind of mood you were in, it was always hard to do anything but smile when you saw him. He really did prove the theory that smiling is contagious. I talked to a few friends of mine who also knew Joey and they had nothing but nice things to say. He truly was one of the kindest people I’ve met and I’m glad to have known him for as long as I did. I can’t imagine the pain you guys are feeling right now, but I hope you can find some comfort in knowing that he was a great young man who lived his life to help others and did so successfully. My condolences go out to you guys in your time of grief. My deepest sympathies to you and to everyone who had the pleasure of meeting Joey. I spent a year with Joey at Five Guys, and we also were students at SHS around the same time. Joey was a wonderful guy and always made my day better through many conversations at work and school. I spoke with him a few times while home from school at Hy-Vee and it was very nice to catch up with him. His loss hurts but I hope we can find solace in the fact that Joey made the world around him a much better place to be. Again, I offer my condolences and deepest sympathies to you in this time. On behalf of the extended Lehman family, we offer our deepest heart felt thoughts, prayers, and condolences to the family and friends. May the Lord comfort you in this difficult time. Matt & Rena Lehman and family. I am truly at a loss of words, and I cannot express in any way enough how deeply pained I am during this devastating time. Joey was my very first friend, and will always be my childhood best friend, even if we drifted apart once we got older. Joey never had a harsh word for anyone, and through my whole life, whether it was a simple passing in the hallway at high school or back during our childhood as best friends, he always knew how to make me laugh. I will never forget the memories Joey and I had during our childhood, it was more than friendship or even best friends, it was family. My prayers, my condolences, and my love go out to the whole family. My deepest sympathies to the Matuza Family, much sadness. So extremely sorry for your deep loss. God bless your entire family. Words cannot express my sincere sympathy to you and your family. You will continue to be in my thoughts and prayers. I’m sorry for your loss. I knew Joey from Hy-Vee and the high school. Joey was one of my best friends. He would take me home occasionally from school. He was a kind, gentle, understanding, and handsome individual. My heart broke when I heard the news. Today, at the funeral, I didn’t know anyone so I stayed silent. I know Joey would’ve wanted me to come out of my protective shell and go introduce myself to you and say my condolences. I gathered all my strength to write this because I felt bad about not saying anything. My thoughts and prayers go to you. Joey will be deeply missed by everyone. I am so very sorry for your loss. My heart breaks for you and your family. I pray that the love of your family and friends will comfort you in the coming days, weeks and months. May Jesus fill your heart with love and peace and may you find strength in him to help you through your time of grief. So heavy the of family left behind. My deepest sympathies to the Matuza family. I never knew this young man, but I briefly knew his mother, and am a first cousin to his grandmother, Jacque Sweeney. My heart goes out to all of you. Much love. Jan Yoder. I was neighbors with Joey during elementary school. I didn’t know him too well, but whenever I interacted with him he seemed like a kind, laid back kind of guy. I remember him wanting to start a YouTube channel with stop motion Lego animations around the 5th grade. This really hurts to see something like this happen and I send my condolences to Joe, Emily, Jacque, Marc, and Luke during this difficult time. Rest in paradise, buddy. We are very saddened for the loss that you are experiencing, our thoughts and prayers go out to you and your family at this so difficult time. Gods speed.